In addition to the natural and technological hazards described in this publication, Americans face threats posed by hostile governments or extremist groups. These threats to national security include acts of terrorism and acts of war. The following is general information about national security emergencies. Acts of terrorism range from threats of terrorism, assassinations, kidnappings, hijackings, bomb scares and bombings, cyber attacks (computer-based), to the use of chemical, biological and nuclear weapons. High-risk targets include military and civilian government facilities, international airports, large cities and high-profile landmarks. Terrorists might also target large public gatherings, water and food supplies, utilities, and corporate centers. Further, they are capable of spreading fear by sending explosives or chemical and biological agents through the mail. In the immediate area of a terrorist event, you would need to rely on police, fire and other officials for instructions. However, you can prepare in much the same way you would prepare for other crisis events. out of a building, subway or congested public area or traffic. Note where staircases are located. Notice heavy or breakable objects that could move, fall or break in an explosion. or container, ready to go. Cyber attacks target computer or telecommunication networks of critical infrastructures such as power systems, traffic control systems, or financial systems. Cyber attacks target information technologies (IT) in three different ways. First, is a direct attack against an information system “through the wires alone (hacking). Second, the attack can be a physical assault against a critical IT element. Third, the attack can be from the inside as a result of compromising a trusted party with access to the system. Be prepared to do without services you normally depend on that could be disrupted electricity, telephone, natural gas, gasoline pumps, cash registers, ATM machines, and internet transactions. 1. Review emergency evacuation procedures. Know where emergency exits are located. 2. Keep fire extinguishers in working order. Know where they are located, and learn how to use them. 3. Learn first aid. Contact the local chapter of the American Red Cross for information and training. 4. Building owners should keep the following items in a designated place on each floor of the building. If you are notified of a bomb threat, do not touch any suspicious packages. Clear the area around suspicious packages and notify the police immediately. In evacuating a building, don’t stand in front of windows, glass doors or other potentially hazardous areas. Do not block sidewalk or streets to be used by emergency officials or others still exiting the building. Have no return address, or have one that can’t be verified as legitimate. Are marked with restrictive endorsements, such as Personal, Confidential orDo not x-ray. Leave the room and close the door, or section off the area to prevent other from entering. Do not move about or kick up dust. Cover your mouth with a handkerchiefor clothing. Rhythmically tap on a pipe or wall so that rescuers can hear where you are. Usea whistle if one is available. Shout only as a last resort when you hear sounds and think someone will hear you—shouting can causea person to inhale dangerous amounts of dust. attention as soon as possible, if needed. in lethal concentrations. Outdoors, the agents often dissipate rapidly. Chemical agents are also difficult to produce. be used as weapons are bacteria, viruses, and toxins. as well through food and water contamination. Aerosols—Biological agents are dispersed into the air, forming a fine mist that may driftfor miles. Inhaling the agent may cause disease in people or animals. Animals—Some diseases are spread by insects and animals, such as fleas, mice, flies,and mosquitoes. Deliberately spreading diseases through livestock isalso referred to as agroterrorism. Food and water contamination—Some pathogenic organisms and toxins may persistin food and water supplies. Most microbes can be killed, and toxinsdeactivated, by cooking food and boiling water. of letters dispersed the spores as aerosols. Several deaths resulted. of handling delivered mail among the public. source of infection for smallpox, plague, and the Lassa viruses. Listen to your radio for instructions from authorities such as whether to remaininside or to evacuate. Turn off all ventilation, including furnaces, air conditioners, ventsand fans. Remain in protected areas where toxic vapors are reduced or eliminated,and be sure to take your battery-operated radio with you. or contact lenses. Put glasses in a pan of household bleach to decontaminate. Decontaminate other body areas likely to have been contaminated. Blot (do not swabor scrape) with a cloth soaked in soapy water and rinse with clear water. Change into uncontaminated clothes. Clothing stored in drawers or closets islikely to be uncontaminated. medical attention for treatment. In some situations, like the anthrax letters sent in 2001, people may be alerted to a potential exposure. warm soapy water immediately. Put on clean clothes and seek medical assistance. particles called fallout that can be carried by wind for hundreds of miles. or “dirty bomb”—is considered far more likely than use of a nuclear device. to weapons grade uranium or plutonium. the area and severity of the effects would be significantly more limited. have been supported by nations that have nuclear weapons programs. or in the middle of a large building. protective factors of a fallout shelter are shielding, distance, and time. Shielding. The more heavy, dense materials—thick walls, concrete, bricks, booksand earth—between you and the fallout particles, the better. nor is a floor adjacent to a neighboring flat roof. Time. Fallout radiation loses its intensity fairly rapidly. In time, you willbe able to leave the fallout shelter. Radioactive fallout poses thegreatest threat to people during the first two weeks, by which timeit has declined to about 1% of its initial radiation level. the more shielding, distance and time you can take advantage of, the better. can create an electromagnetic pulse (EMP), a high-density electrical field. EMP acts like a stroke of lightning but is stronger, faster and briefer. or other implanted electronic devices. Learn the warning signals and all sources of warning used in your community.Make sure you know what the signals are, what they mean, how they willbe used, and what you should do if you hear them. Assemble and maintain a disaster supply kit with food, water, medications, fueland personal items adequate for up to 2 weeks—the more the better. (Seethe “Emergency Planning and Disaster Supplies” chapter for more information). Find out what public buildings in your community may have been designated asfallout shelters. It may have been years ago, but start there, and learnwhich buildings are still in use and could be designated as sheltersagain. Look for yellow and black fallout shelter signs on public buildings.Note: With the end of the Cold War, many of the signs have beenremoved from the buildings previously designated. If no noticeable or official designations have been made, make yourown list of potential shelters near your home, workplace and school:basements, or the windowless center area of middle floors in high-risebuildings, as well as subways and tunnels. Give your household clear instructions about where fallout shelters arelocated and what actions to take in case of attack. If you live in an apartment building or high-rise, talk to the manager aboutthe safest place in the building for sheltering, and about providingfor building occupants until it is safe to go out. There are few public shelters in many suburban and rural areas. If you areconsidering building a fallout shelter at home, keep the following inmind. A basement, or any underground area, is the best place to shelterfrom fallout. Often, few major changes are needed, especially ifthe structure has two or more stories and its basement—or one cornerof it—is below ground. See the “Tornadoes” section in the “Thunderstorms” chapter for informationon the “Wind Safe Room,” which could be used as shelter in the eventof a nuclear detonation or for fallout protection, especially ina home without a basement. All the items you will need for your stay need not be stocked insidethe shelter itself but can be stored elsewhere, as long as you canmove them quickly to the shelter. Learn about your community’s evacuation plans. Such plans may include evacuationroutes, relocation sites, how the public will be notified and transportationoptions for people who do not own cars and those who have special needs.See the “Evacuation” chapter for more information. Acquire other emergency preparedness booklets that you may need. See the “ForMore Information” chapter at the end of this guide. Do not look at the flash or fireball—it can blind you. Take cover as quickly as you can, BELOW GROUND IF POSSIBLE, and staythere unless instructed to do otherwise. If you are caught outside, unable to get inside immediately, take coverbehind anything that might offer protection. Lie flat on the groundand cover your head. If the explosion is some distance away, it could take 30 seconds ormore for the blast wave to hit. the three protective factors: shielding, distance and time. Keep a battery-powered radio with you, and listen for official information.Follow the instructions given. Local instructions should always takeprecedence: officials on the ground know the local situation best. Do not leave the shelter until officials say it is safe. Follow their instructionswhen leaving. If in a fallout shelter, stay in your shelter until local authorities tellyou it is permissible or advisable to leave. The length of your staycan range from a day or two to four weeks. Contamination from a radiological dispersion device could affect a wide area,depending on the amount of conventional explosives used, the quantityof radioactive material and atmospheric conditions. A “suitcase” terrorist nuclear device detonated at or near groundlevel would produce heavy fallout from the dirt and debris suckedup into the mushroom cloud. A missile-delivered nuclear weapon from a hostile nation would probablycause an explosion many times more powerful than a suitcase bomb,and provide a greater cloud of radioactive fallout. The decay rate of the radioactive fallout would be the same, makingit necessary for those in the areas with highest radiation levelsto remain in shelter for up to a month. The heaviest fallout would be limited to the area at or downwind fromthe explosion, and 80% of the fallout would occur during the first24 hours. Because of these facts and the very limited number of weapons terroristscould detonate, most of the country would not be affected by fallout. People in most of the areas that would be affected could be allowed tocome out of shelter and, if necessary, evacuate to unaffected areaswithin a few days. Although it may be difficult, make every effort to maintain sanitary conditionsin your shelter space. Water and food may be scarce. Use them prudently but do not impose severerationing, especially for children, the ill or elderly. Cooperate with shelter managers. Living with many people in confined space canbe difficult and unpleasant. toppling chimneys, falling bricks, collapsing walls, plaster falling fromceilings. Immediately clean up spilled medicines, drugs, flammable liquids, and other potentiallyhazardous materials. Listen to your battery-powered radio for instructions and information aboutcommunity services. Monitor the radio and your television for information on assistance that maybe provided. Local, state and federal governments and other organizationswill help meet emergency needs and help you recover from damage andlosses. Do not turn the gas back on. The gas company will turn it back on foryou or you will receive other instructions. Turn the water back on at the main valve only after you know the watersystem is working and water is not contaminated. Turn electricity back on at the main switch only after you know the wiringis undamaged in your home and the community electrical system isfunctioning. during a period of heightened alert. it is voluntary to other levels of government and the private sector. at regular intervals to determine whether adjustments are warranted. Institute a process to assure that all facilities and regulated sectors are regularlyassessed for vulnerabilities to terrorist attacks, and all reasonablemeasures are taken to mitigate these vulnerabilities. 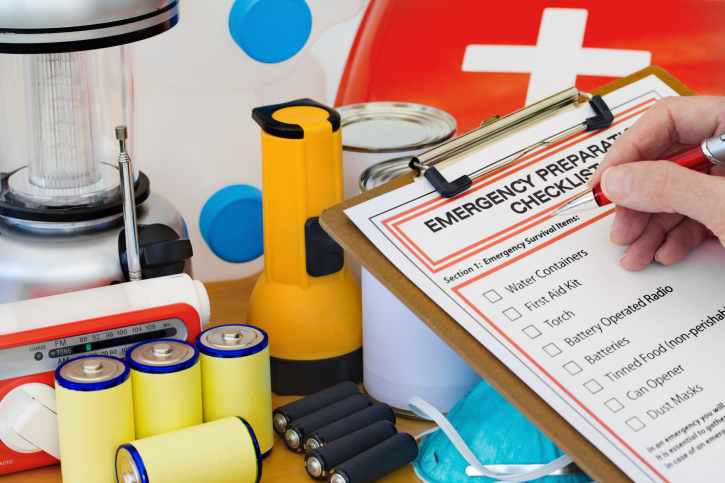 Develop a household disaster plan and assemble a disaster supply kit. (see “EmergencyPlanning and Disaster Supplies” chapter). Provide the public with any information that would strengthen its ability toact appropriately. People with special needs should discuss their emergency plans with friends,family or employers. Severe Condition (Red). A Severe Condition reflects a severe risk of terrorist attacks. Close public and government facilities not critical for continuity of essentialoperations, especially public safety. Prepare to take protective actions such as sheltering-in-place or evacuationif instructed to do so by public officials.